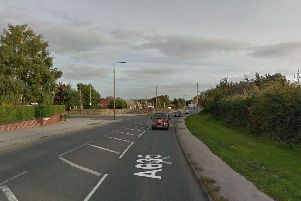 A 70-year-old woman, living at a house in Spring Walk, Rotherham, had been putting her bin out when a man, wearing dark clothing with his face covered, jumped over her garden gate and walked into the house, at around 4.40pm on Tuesday, September 5. Police say the man claimed he was being chased and needed help but instead tied the pensioner up as he rooted through the house. He left the house a short time with a 'large amount of jewellery' and was thought to have headed in the direction of Nottingham Street carrying a white pillow case with the loot inside. Detective Chief Inspector Steve Ashmore investigating, said: "The man, who was also wearing gloves and is described as skinny, then subjected the woman to an extremely distressing ordeal, leading her around the house asking her where her jewellery was before tying her up. “Thankfully, the woman was able to untie herself soon after and phone police. She sustained minor injuries as a result of the incident. A thorough investigation is now underway to identify the suspect and this is being treated as an absolute priority for our team. “Although we do believe this to be a targeted attack, I’d like to ask anyone who saw or heard anything suspicious to please get in touch with us. “If you think you know who could be responsible or remember seeing someone acting suspiciously in the Spring Walk area yesterday, please contact us via 101." Call police quoting incident number 810 of September, 5, 2017.